Over there. Over the back. Over some of the 440 acres of the Port Meadow that have never been ploughed, vested to the burghers of Oxford by either King Alfred or William the Conqueror (contested: official guide book v. Wikipedia) for their help in sending the Danes packing around the turn of the first millennium, and subject to regular flooding. Still can’t see it? No? You might need to go back to Matthew Arnold (Line 19) for further advice. But dreaming spires or not, Oxford looked like a lot of fun, a place to go back to and spend more time. If I say we wanted to do three things it will sound like we were organised. We are organised but within a very limited compass. 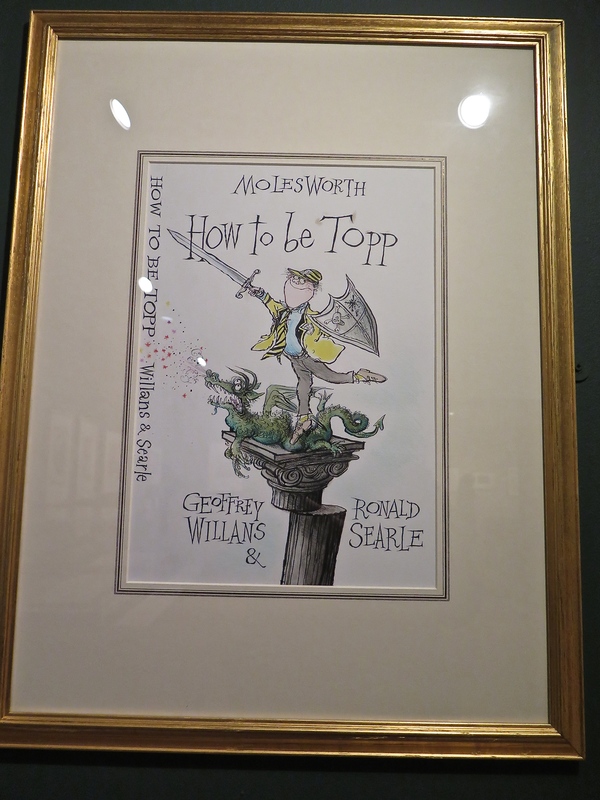 However, when we were walking through town we had walked past some posters advertising a show of ‘Great British Drawing’ at the Ashmolean. That sounded attractive and we got enthusiastic. I tried to get tickets on the website and couldn’t pull it off. Our hosts thought it would possibly be booked out. Myrna wanted to chase down the groovy part of town to see what was offering in terms of fashion, and we both wanted a swim to use some different muscles. After a brief tutorial on bus usage and a longer session locating a suitable pool, we set off in light rain walking past the Martyrs’ Memorial (Thomas Cranmer in flames; I should have paid more attention) and all sorts of other no doubt significant architecture. 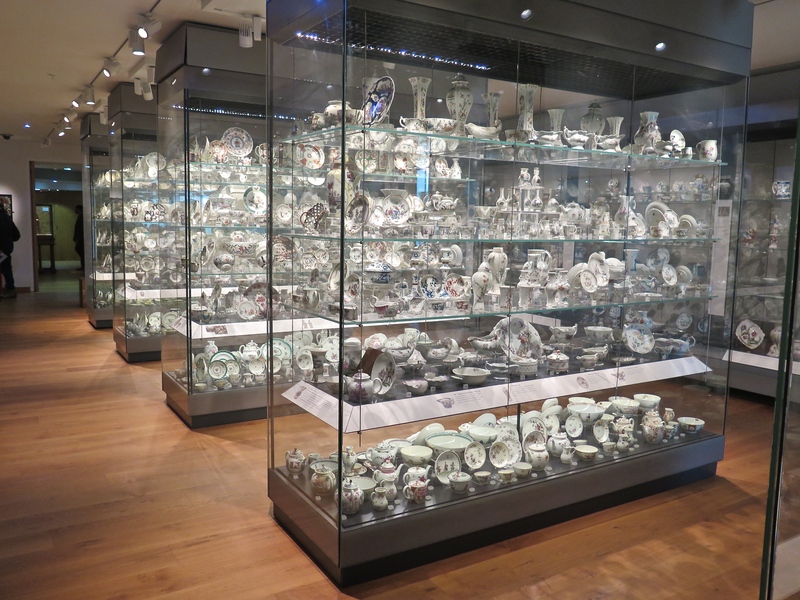 It was a grey Sunday morning with absolutely no one about and that included aspirants for viewing ‘Great British Drawing’. There were more people on the desk (four) than in the exhibition. This turned out to be more Great British than Great Drawing but it was interesting enough. I include this especially for members of my family who will understand. It is the original. Any fule kno that. Seeing this was a highlight of my advancing years. Enuff said. The museum itself more than made up for any inadequacy in the drawings. I was overwhelmed by the china, the collective noun for which may be ‘surfeit’, but the Scandinavian runestone and Alfred’s Jewel definitely gripped me. 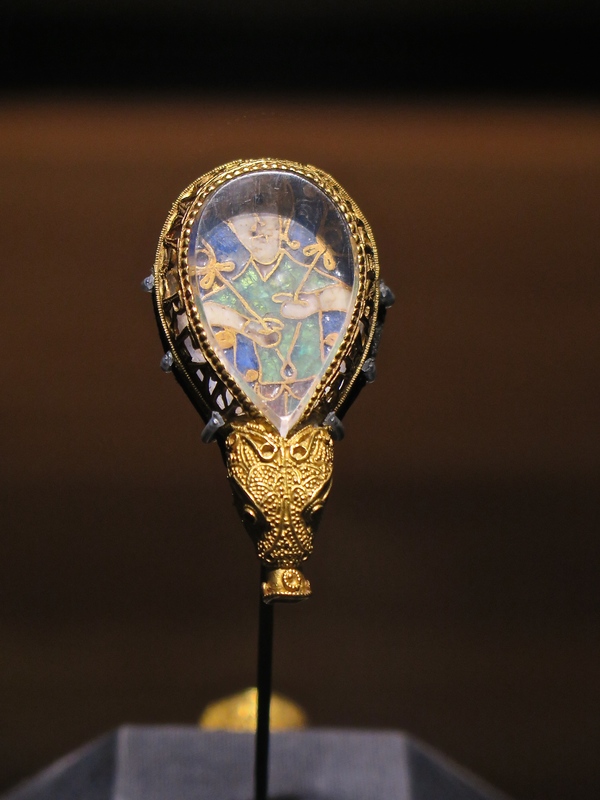 Wikipedia notes that the ‘Jewel’ is an Anglo-Saxon artefact made of enamel and quartz enclosed in gold (about as big as your thumb, a big thumb) that was discovered in 1693, and has been dated from the late 9th century. It was made in the reign of Alfred the Great and is inscribed ‘aelfred mec heht gewyrcan’, meaning ‘Alfred ordered me made’. The jewel was once attached to a rod, probably of wood, at its base. After decades of scholarly discussion, it is now ‘generally accepted’ that the jewel’s function was to be the handle for a pointer stick for following words when reading a book (or whatever was to be read) suggesting that Alfred may have been literate. I like that idea. We walked off to Jericho looking for the groovy shops and they might have been there, but they may also have been disguised by the weather, the time and the day of the week. An inspection was conducted of several but the expert could find nothing that obtruded from the ruck. 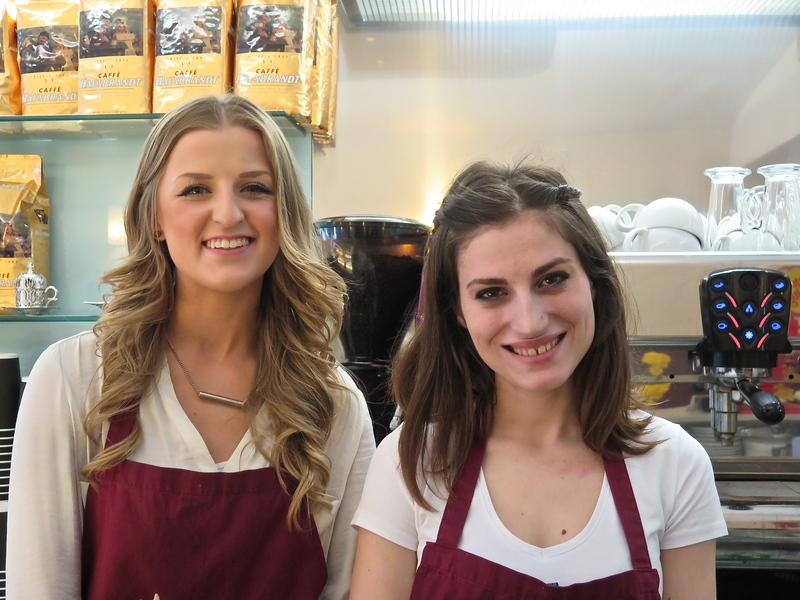 We had a good cup of coffee and an outstanding banana split at a café nearby, and then with the very helpful assistance of these two splendid gals spent 40 minutes trying to raise a taxi. The drive through the northern suburbs to the Ferry Pool Leisure Centre was at least as interesting as the city centre. After getting a sworn declaration that a taxi would return to the pool for us in an hour, we joined the two other foreigners swimming laps. I was examining the church but heard crowd noises close at hand and thought I should investigate. I would have liked to have seen a game of rugby at Oxford. And so I did, Oxford versing Gloucester All Gold; but it wasn’t union, it was league — not the dullest game on earth but a promising candidate. And what on earth was league doing this far south anyway? Surely there’s some barrage or gate near Nottingham or Leicester where the size of south-bound immigrants’ necks is measured, along with their propensity for running into brick walls. 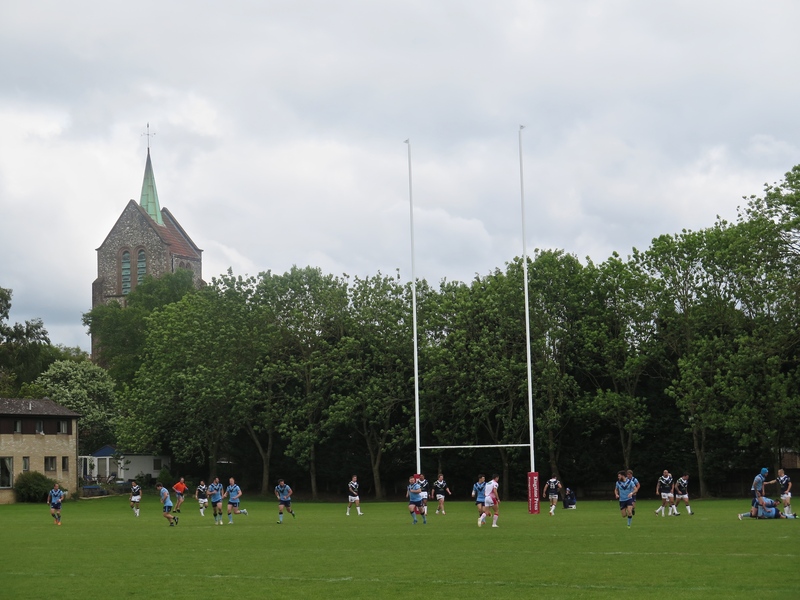 I found myself standing next to the team manager’s wife — one son was providing radio commentary, the other was shooting the video — and we had a long conversation about the task of building a rugby league team in Oxford. They were from Leeds and each weekend drove down for the games. Being Australian, I was presumed to be an expert. Pas de problème. I had watched the most recent State of Origin, plus I’m a big fan of Billy Slater’s. End of story really. I was happy to oblige. Yet another instance of leaving England just that little bit better off than when we arrived. Launched ourselves at the Magdalen Arms again and observed one of the great domestic non-competitive eatathons ever. I think the table of four next door consumed the entire menu. That’s what it looked like anyway. Our requirements were more modest and again most agreeably satisfied. 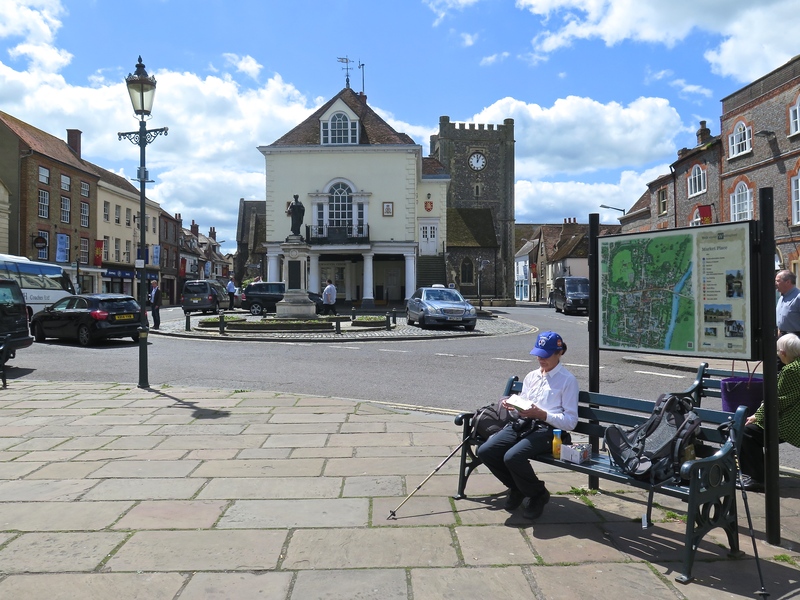 (Dorchester above) Midsomer is the county. Causton is the town. The ground is not covered in blood so much as corpses, because it’s the manner of death that matters more than the attendant gore. You may be impaled, for example, by a filigreed letter opener or trampled by a rabid badger. You may die by staring too fixedly at a photo of Tony Blair, or be throttled by a radio-controlled Barbie doll. It is, so to speak, murder. 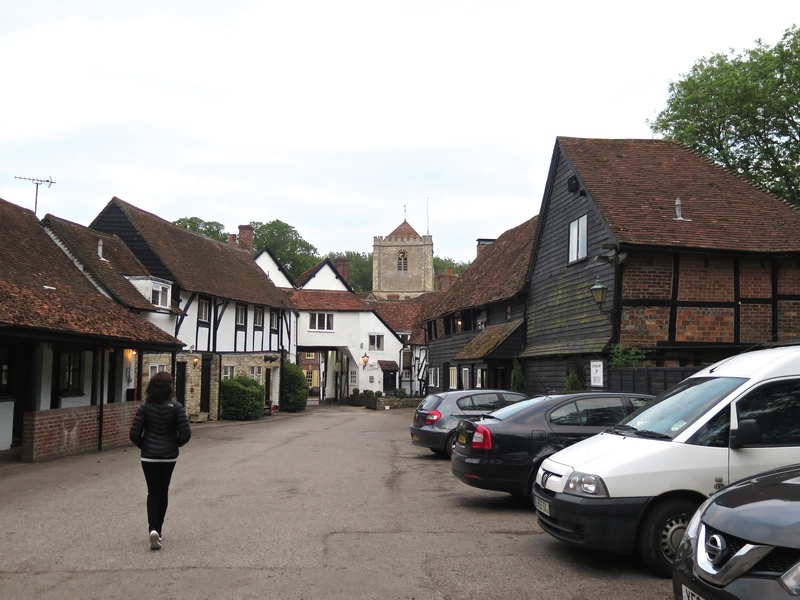 I organized the walk so we could spend a night at Abingdon because I thought, mistakenly, that it was one of the prime sites for filming ‘Midsomer Murders’. But no. 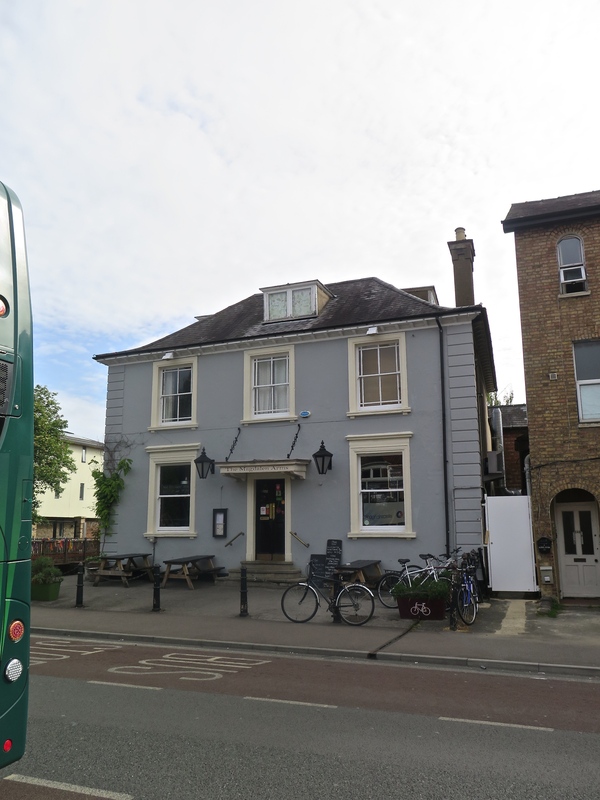 Wallingford is one base, and it was in the pub at Dorchester that we found the photos signed by Detective Chief Inspector Barnaby and his sidekick Detective Sergeant Jones. In March 2011, the series’ producer, Brian True-May, was suspended by his company after telling the magazine Radio Times that the program did not have any non-white characters because the series was a ‘bastion of Englishness’. When challenged about the term ‘Englishness’ and whether that would exclude different ethnic minorities, True-May responded: ‘Well, it should do’, adding somewhat unnecessarily, ‘Maybe I’m not politically correct’. Mr True-May crept out of his crease only just a little too far. He could have simply said, well that’s who lives where we make the series. Because I don’t know who lives in this little patch of southern Oxfordshire but very few of them appeared to have skin other than of a pinkish hue (and the vast majority seemed to drive very expensive cars). As the District Council says: ‘Although located less than an hour from London, Southern Oxfordshire is a proper rural retreat of village greens, country pubs and thatched roofs; the ideal spot to recharge batteries.’ Or to be murdered in some highly imaginative way by another Anglo-Saxon. 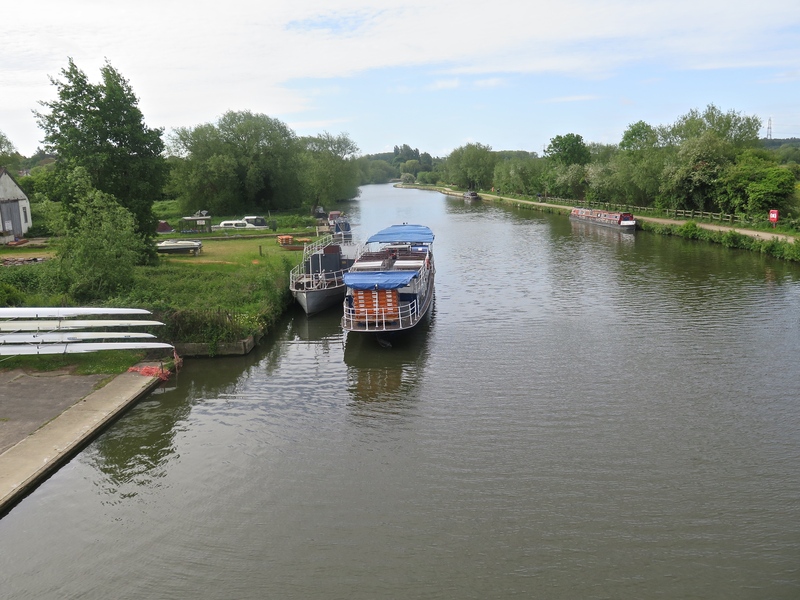 It was the first day of summer when we got back on the Path, a day which was chilly, short (we began from well down the Iffley Road) and without incident. This is where we got back on. You can see the very well-trodden (and cycled, by rowing coaches) version of the Path running along the far side. One VNH that in other circumstances I may have coveted. 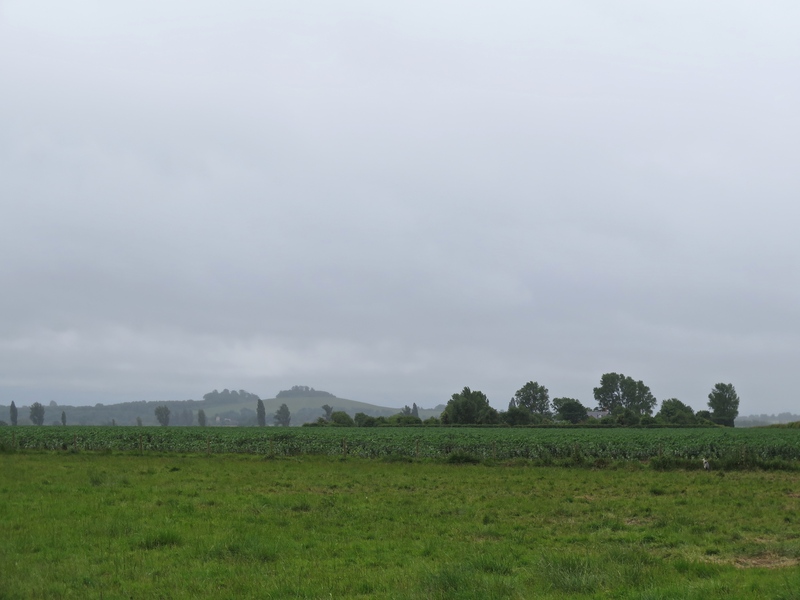 It is not a great photo because it doesn’t show how well the house was settled into its landscape. In addition I was trying to do something clever with the tree in the foreground that absolutely did not come off. The property was beautifully maintained, and we watched the tribes at work on it. 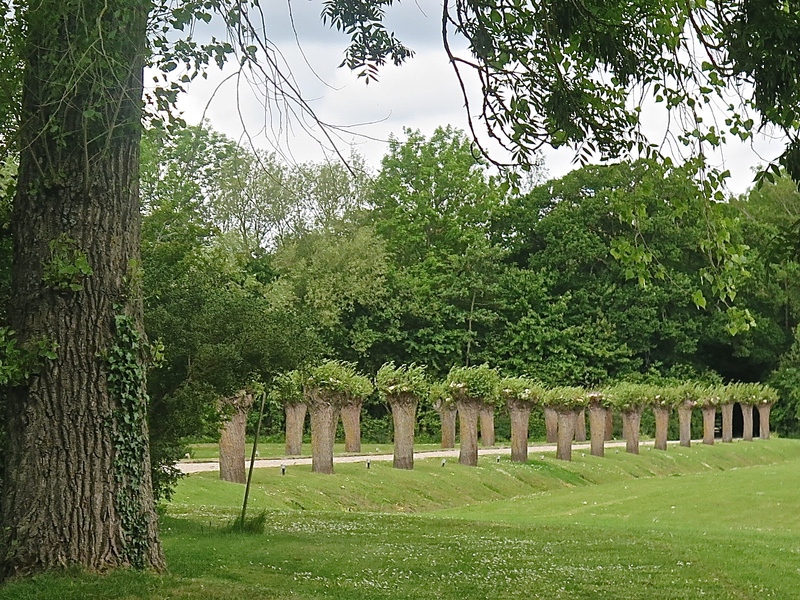 You want to see how trees should be pollarded? Like this. It reminded us of walking from South Head back to the city in Sydney through some of the most expensive real estate on earth. Did we see any of the inhabitants? No we didn’t. On a daily basis the people enjoying the southern shore of Sydney harbor are cleaners, gardeners and tradespeople. Much the same thing seemed to be occurring here. We came to a reach almost four km long, just a slight bend in it, which would be a rower’s heaven. Radley College’s sprawling boatsheds with their 11 follow boats moored to the landing were well located to take advantage of this. We’re walking through serious money here. The tourist water buses went up and down empty, or near as dammit. If you are bothered to click on the pic above you will see one lonely soul. And geese, it was a day of geese. We found one spot where they had obviously been nesting, although the goslings were now well advanced. A semicircle 50m in diameter had been carved into the crop by foraging geese. Just bare earth was left. 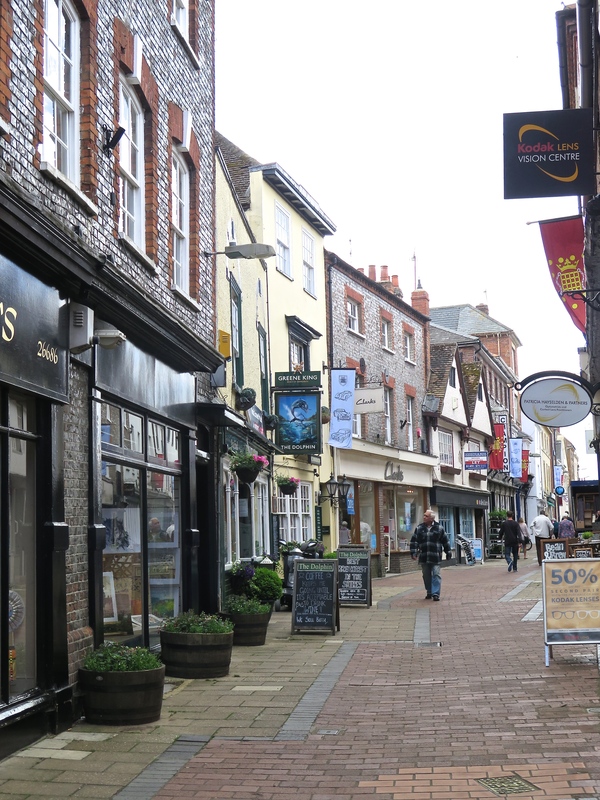 We got to Abingdon at lunchtime and tooled around its streets. The town has its stories: possibly the oldest continuously inhabited settlement in the country with evidence of Iron Age humankind; bun-throwing from the roof of the C17th County Hall to celebrate big moments; a rather lovely bridge that meets on an island in the middle of the Thames; home of MG (Morris Garage) sports cars. But it mightn’t have been exactly at its best. We were waiting for a thunderstorm, this time with 80-100 mph winds, a good big one — and the town all looked a bit tired, old and, if you can look smelly, smelly. In the built environment it often doesn’t take much for the picturesque to slip on the more honest garb of decrepitude. The weather plays its part. 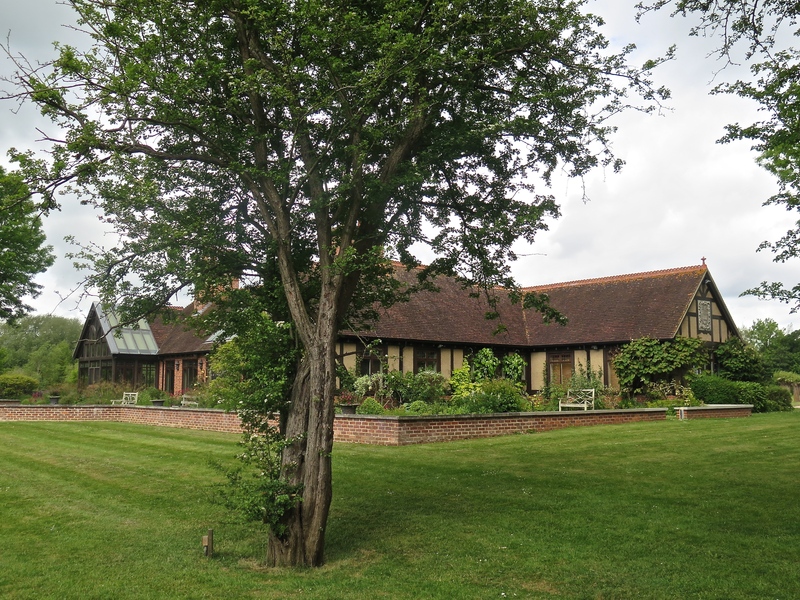 Our accommodation, the Kingfisher Barn (rated ★★★★) was an intriguing study in the second rate. Everything, through and through — just off. The reception, the cleaning, the furniture, the bathroom, the breakfast, the floor of the breakfast room, the works. Except for the car parking. You could readily find a car park there. And Myrna will correct me here. We had a swim in a small tepid pool that was pleasant enough. To eat we walked the mile back into town to The Nag’s Head through biting sleet, the precursor of the storm, the receptionist driving in the same direction after work casually nudging us off the road onto the wet verge. The Nag’s Head (at right, on the bridge) had good food, but the entertainment was watching a couple both breaking up and cementing their relationship at the same time. While he spoke to her intently she would look wooden, occasionally yawning and stretching expansively. He would cry, she would hug and kiss him. He would turn away. She would plead. He would go and get another drink. She would draw him into her arms and they would cuddle. Then she would cross her arms and look away, turn back and speak to him solemnly, get up to go. He would grab her arm, she would pull away, and then return. She would look serious and try to be reasonable. Tears would well in his eyes. Repeat four or five times. Foreplay for sure, but what would happen after that night was anybody’s guess. I want you to know I wasn’t staring. That night also we finished reading ‘Cymbeline’. What was he (Shakespeare) thinking? In his critical reflection on the play Dr Johnson wrote: ‘To remark the folly of the fiction, the absurdity of the conduct, the confusion of the names and manners of different times, and the impossibility of the events in any system of life, were to waste criticism upon unresisting imbecility, upon faults too evident for detection, and too gross for aggravation.’ Correct weight Sam. The predicted storm arrived. It was a night of violent weather and it rained all next morning. Just steadily. Nothing remarkable. My feet had been constantly wet for some days, but that was a function of long wet grass as much as rain. We were back on the river bank weaving around a lot of damp patches, dams, small swamps, alternate bits of stream. 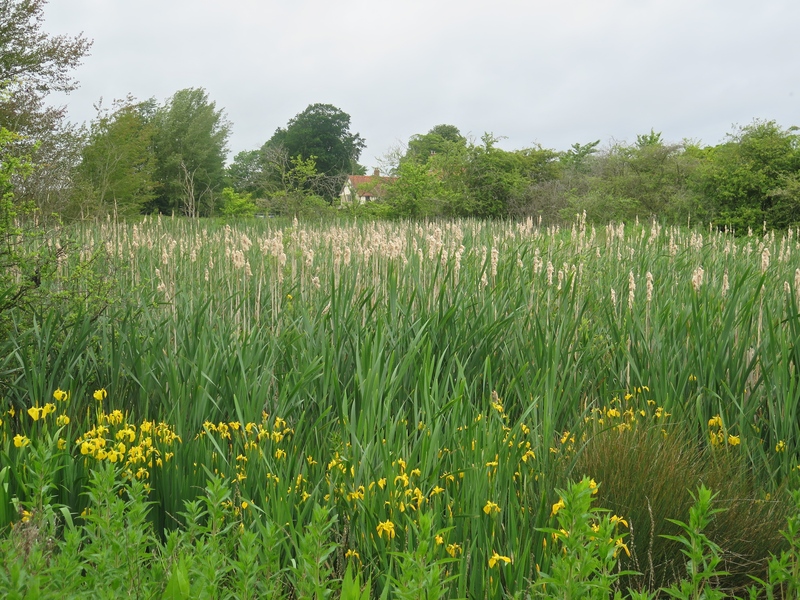 Crowds of yellow irises growing with their feet in water poked their heads clear of the rushes and other tall water plants. 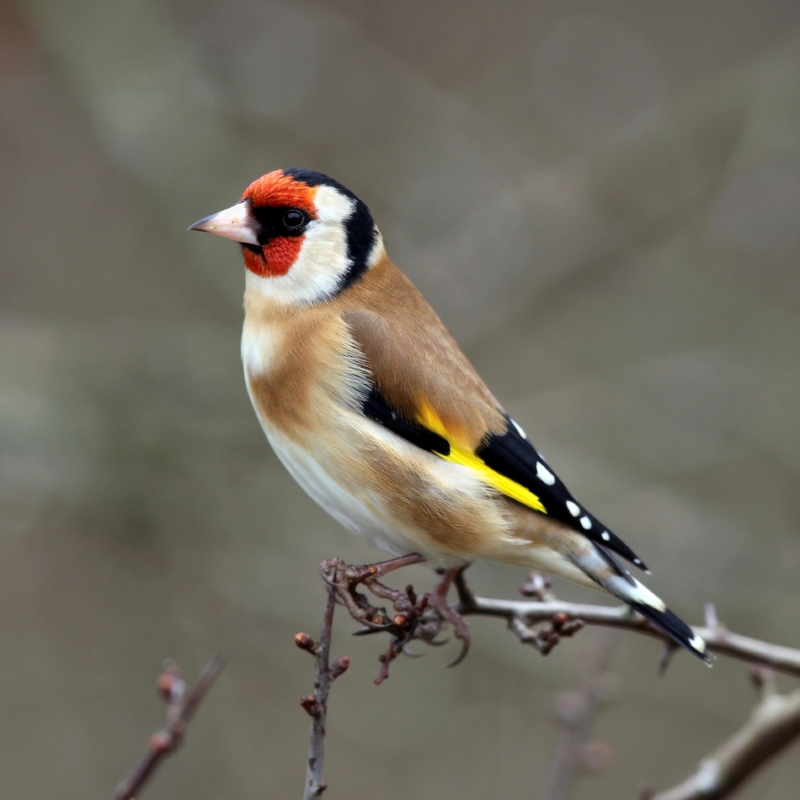 Some gold finches appeared for us. 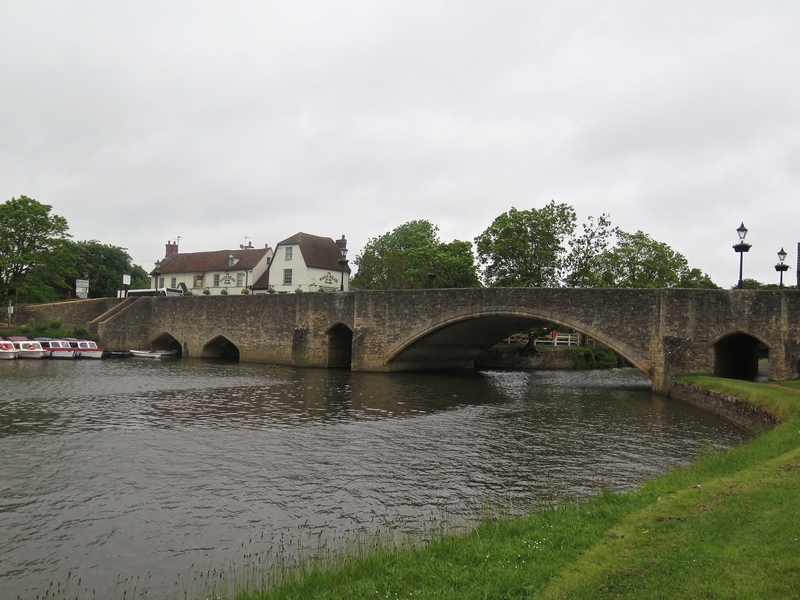 We also ran into the first of many bridges for the extremely busy Oxford-London train line. 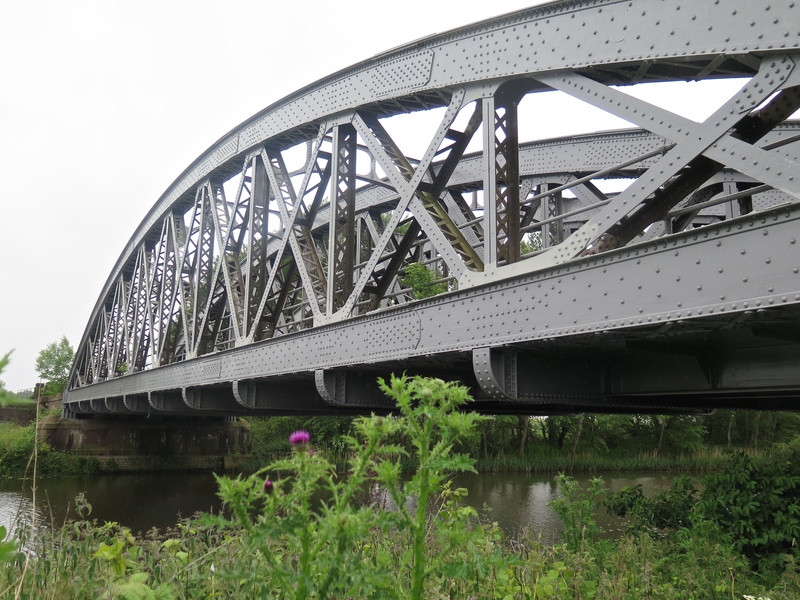 This is a truly fabulous piece of early Victorian steel work, 170 years old and as good as the day it was opened. After a short leg south and a right angle the track took a slow curve right and then, lazily, most of a circle in the opposite direction to Day’s Lock staying on the pastoral rather than the settled bank. 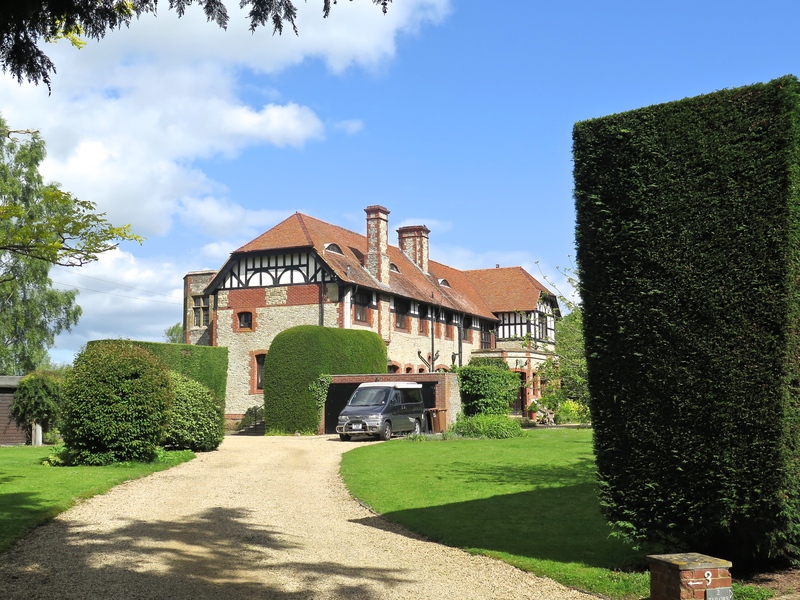 If you wish you can duck off to Sutton Courtenay (where Eric Blair/ George Orwell is buried), Appleford or Long Wittenham, but it is not until Clifton Hampden that you must encounter settlement. This view is supposed to be one of the highlights of the walk. It could be. It may be better in autumn with a lot of leaf colour. Given my choice I’d have stopped the rain and brought the narrowboat up into the foreground, but you take what you can get. It was a lovely bridge. The bricks were a very desirable shade of red with just the right amount of blue in it. But more to the point it was lunchtime and we had our fingers crossed that The Barley Mow might be able to oblige us. 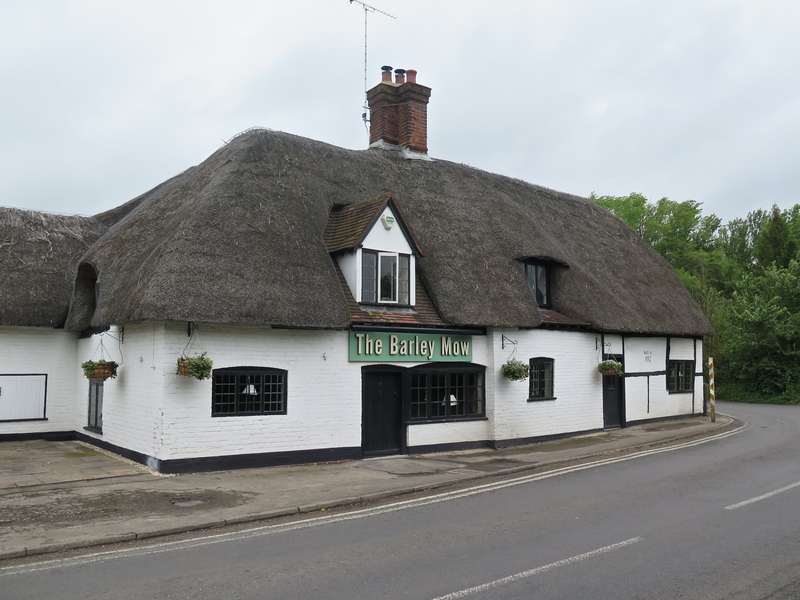 It had been a slightly miserable morning, and this was the The Barley Mow. Referred to very positively in Three Men in a Boat, thatched roof, built in 1352, the requisite number of beams on which you can brain yourself — the Ye Olde England works. We had a quiet reconnoitre because it was actually 11.40 rather than midday when it was due to open and no one seemed to be about. But one of the staff generously let us in and suddenly life looked better. This was one of the great steak and ale pies ever. 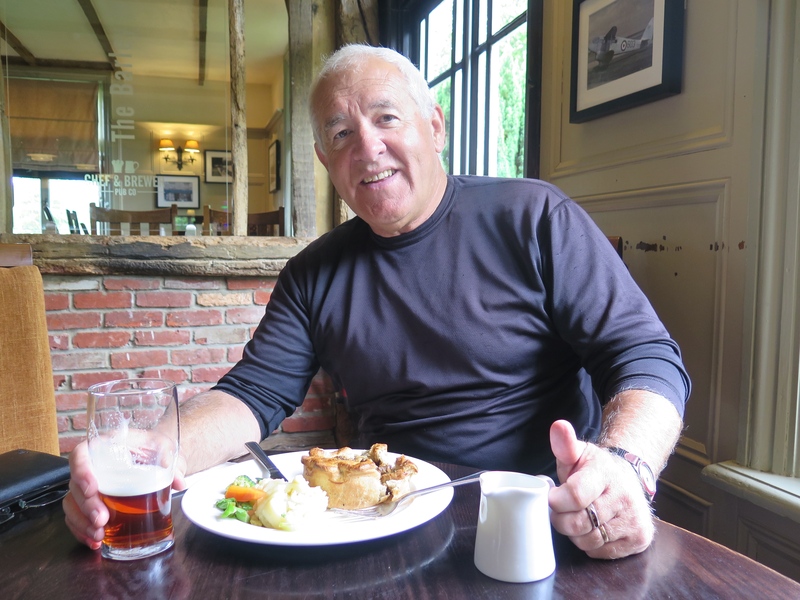 It began a steak and ale pie crawl through the pubs of the Home Counties, the products of which were often very good but never challenged the benchmark established here. Suitably refreshed we moved on with the Wittenham Clumps mostly in view through the rain and mist. I had misread the guidebook and believed them to be the Queen Mother’s favourite part of England. I spent quite some time trying to work out why. 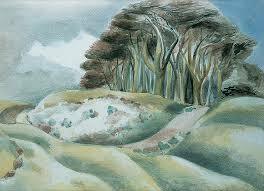 In fact she had a painting of Paul Nash’s called ‘Wittenham Clumps’ (one of many possible options is at right) above her bed … and after two nights probably never noticed it again. Their more formal name is the Sinodun Hills. Dun = Fort; Seno = Old. That might make them more interesting. Maybe. A very good breakfast at the George where, in a sunny conservatory, we discovered the 50 other people who had been staying there. There hadn’t been a day, and wasn’t, when I didn’t think, whacko, this is going to be fun, let’s get on the track — but I felt especially bright and fit this morning. We’d slept well after watching ‘Skyfall’, Daniel Craig being James Bond. I hadn’t remembered how patriotic it was, a London Olympics Queen’s Jubilee year paean to Britain and things British. This was a great day, diverse and intriguing. 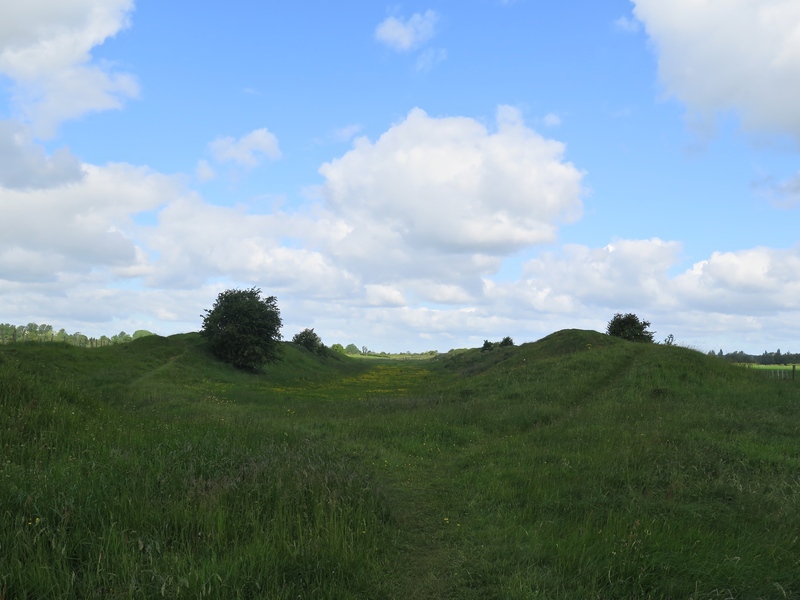 We left Dorchester past the dyke hills, remnants of an Iron Age fort, well pre-Roman, before Myrna felt in her pocket and decided she would take the key back while I watched a group of kites playing in the air currents. 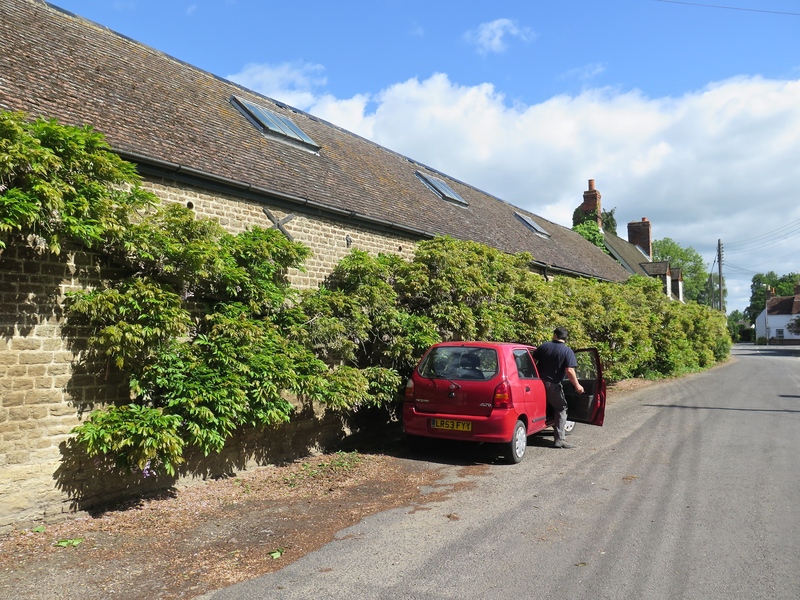 The name of this house at Shillingford is Wisteria House. Are you able to tell me why? And yes, just the one plant. 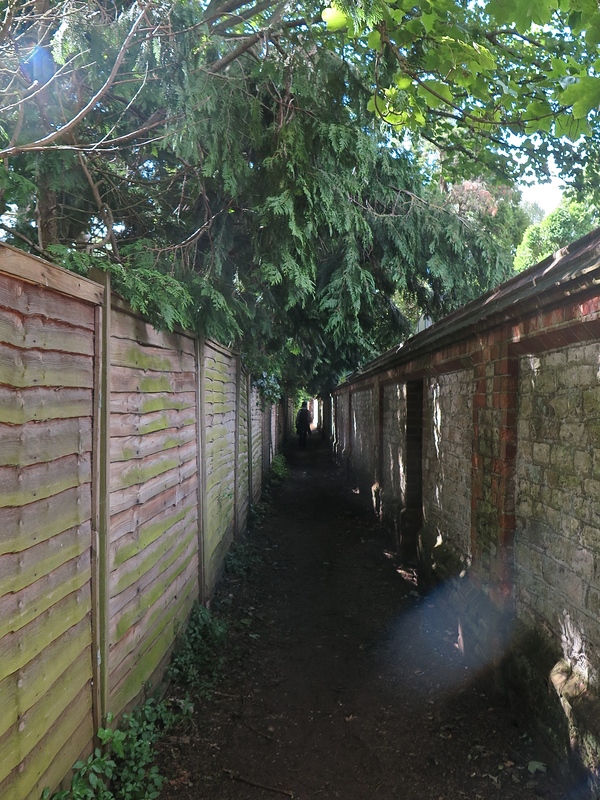 And at the end of this stub of a road the Path goes a couple of hundred metres down this long lane. It’s always entertaining trying to imagine what’s on the other side of such a determined barrier. So you too don’t have to sneak up the drive, it was this. 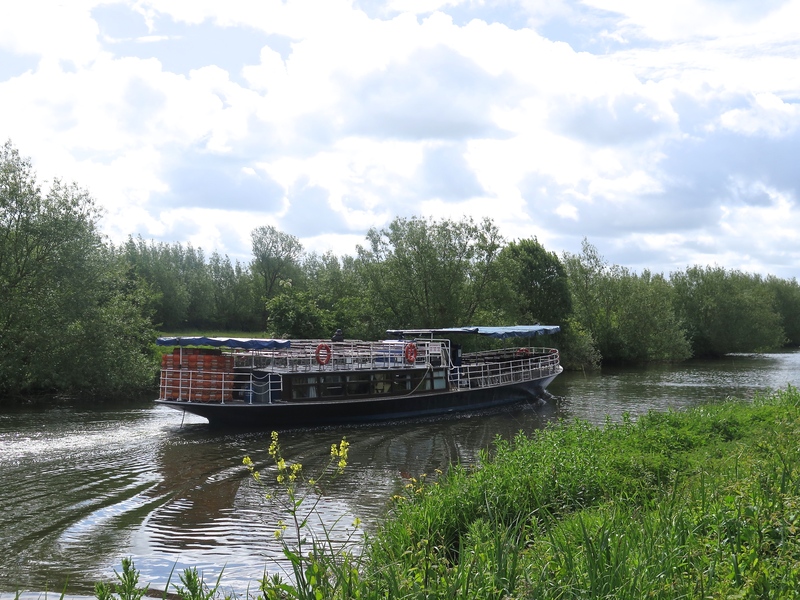 But we’d scarcely got started when we arrived at Benson where we were delighted to join a rather select group of the bourgeoisie in an early brunch on a perfectly located deck next to the lock. Fellow walkers, plan to eat and drink here. To quote a departed friend who was proud of his rather faint Marxist tinge: ‘You can say what you like about the bourgeoisie, but by Christ they know how to live.’ And then it seemed a matter of minutes to Wallingford. 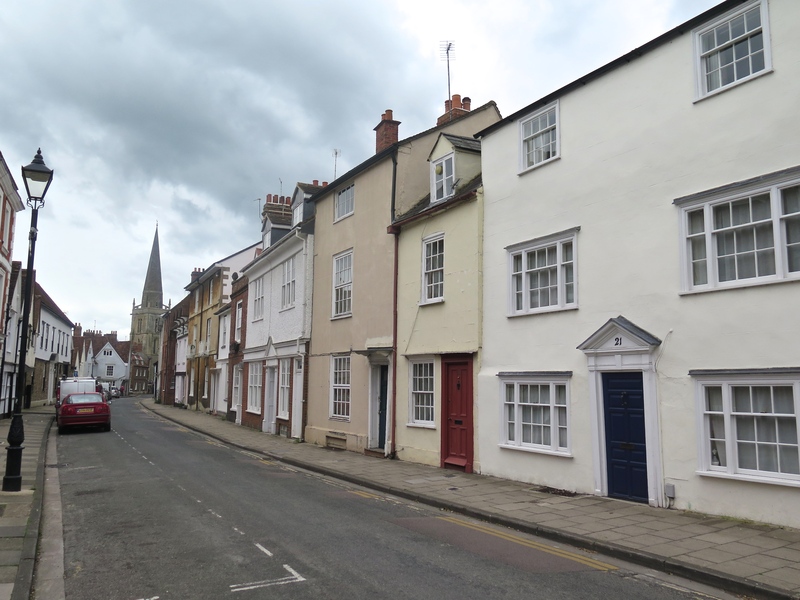 Wallingford was all that Abingdon hadn’t been. Myrna bought some sunglasses in a very grand Waitrose. I bought some lollies at the lolly shop, and the sandwiches were excellent. It doesn’t look like it above, but the square was busy. The streets really were South Oxfordshire. We found the site where Oliver Cromwell’s cohorts had dilapidated a very ancient castle for taking the wrong side in the Civil War. Or perhaps because the building went into decline after the advent of the Black Death in 1349 and the stone was taken to Windsor to be used for the castle there. They both sound reasonable explanations. 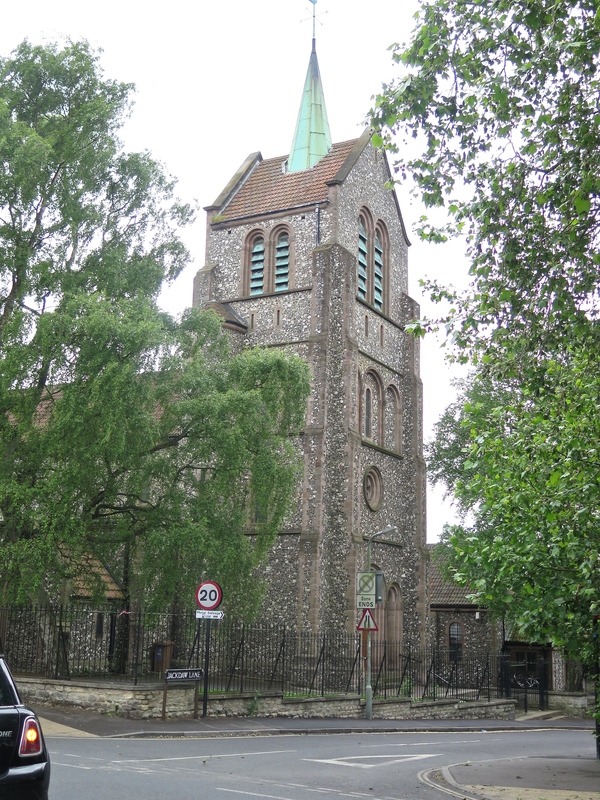 The open-work spire of St Peter’s was stylish and on the walk out of town we found another church both glamorous and staid with that odd stone again. ‘What is that stone! !’ I ask in my journal. It was everywhere. On this sumptuous day and at this point the river was glassy, wide — about 25-30 metres here — and straight-ish. Perfect again for rowing. No sooner had we got out of town than we fell on the enormous Oxford University Boat Club sheds. Sheds! We can’t say ‘sheds’. Boathouse. Boathouses. Boats houses. Enough to accommodate a great many Syrian refugees. And mansions. We had stepped well up from VNHs. They started to appear across vast green swards, several confidently exposed to the hoi polloi. 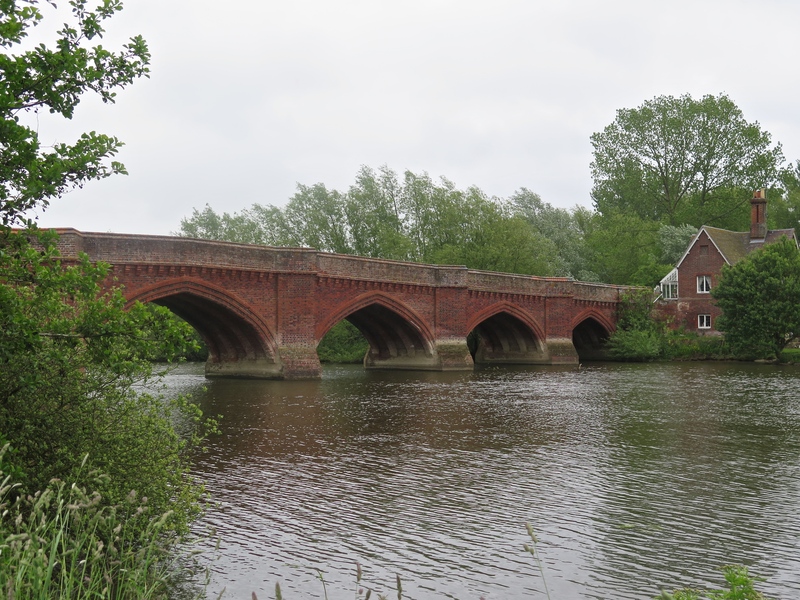 The viaduct at Moulsford amazed me, a rail bridge crossing the river at an oblique angle built with not just four skew arches but with curved intradoses as well, and all from brick. 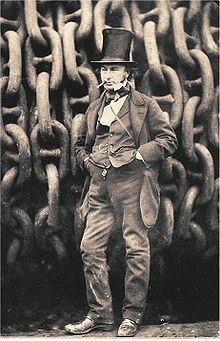 I think Brunel must have sat at home thinking, hmm how much harder can I make it? What can I pull off next? There were chaps patching it up as we went past, but the first version is 177 years old. (An additional bridge was built in 1892 to provide four tracks. As previously noted this is a busy line and it will be your companion for the 70km of Oxford to Reading.) 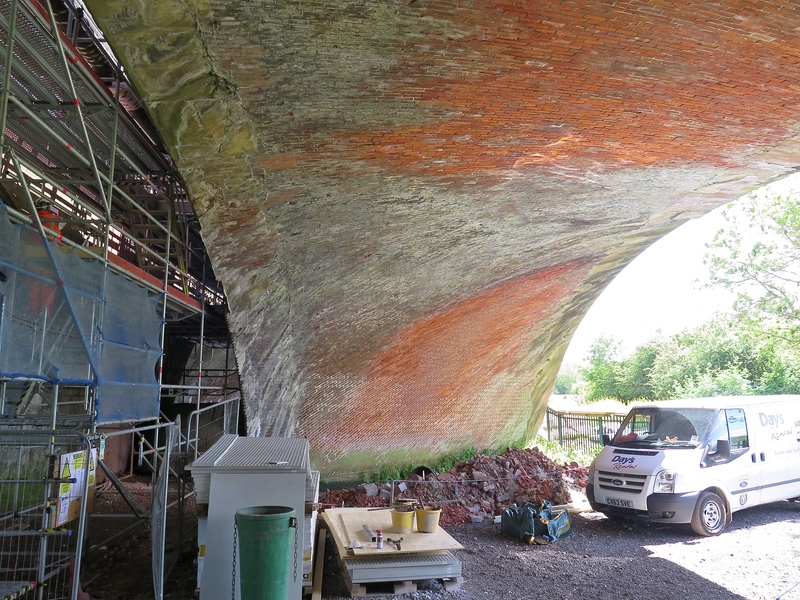 Skew arches are hard enough to design and build, but the additional curve in the intrados, the underside of the arch, everything has a name — well, I just can’t fathom how it would be built. At the viaduct you turn right off the river. 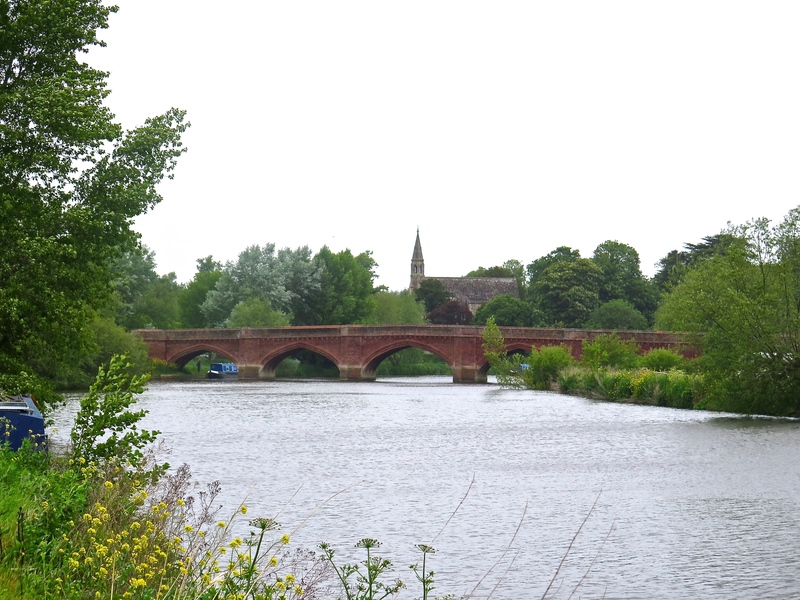 I thought at the time and elsewhere (Shiplake for example) one reason for deviation from the river was money. In this case we had to make our way round a Prep School. We could hear a host of golden children behind a hedge but we couldn’t see them. 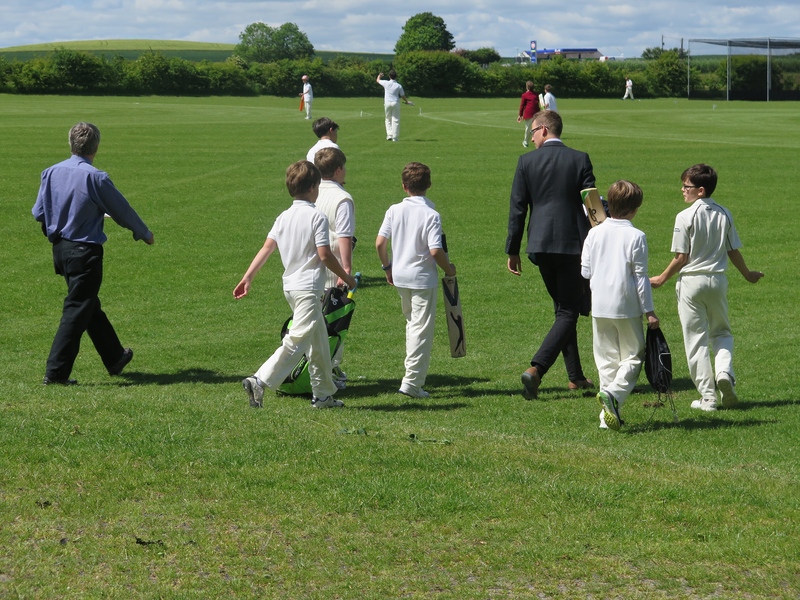 It was sports day and suddenly we could see them, hundreds of them, the future of England and possibly some of the wealthier and more stable parts of the Middle East and the sub-continent, all in their whites. 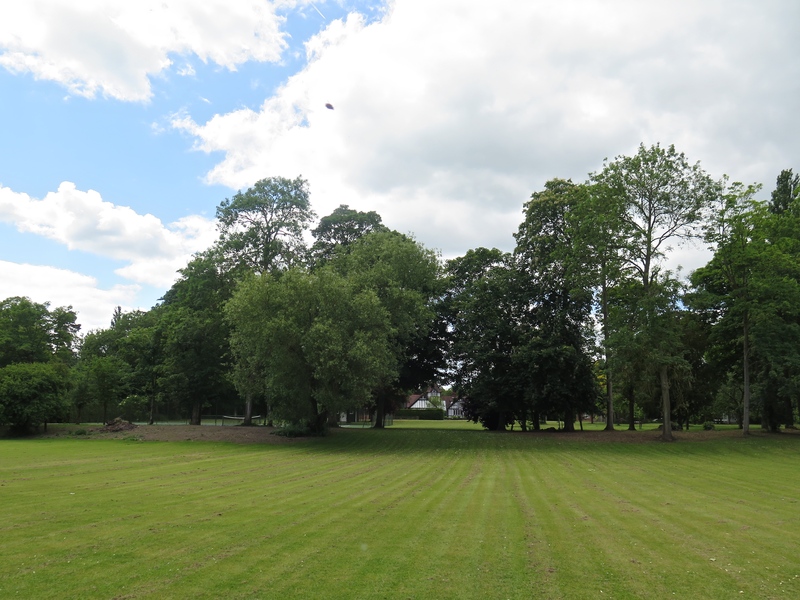 This was Moulsford Prep School. Shortly we passed Cranford House, another school, P-12 this time, the motto of which is Per salicem ad alta, ‘Through willow to the heights’. True. Possibly another more classical reference to the significance of cricket. 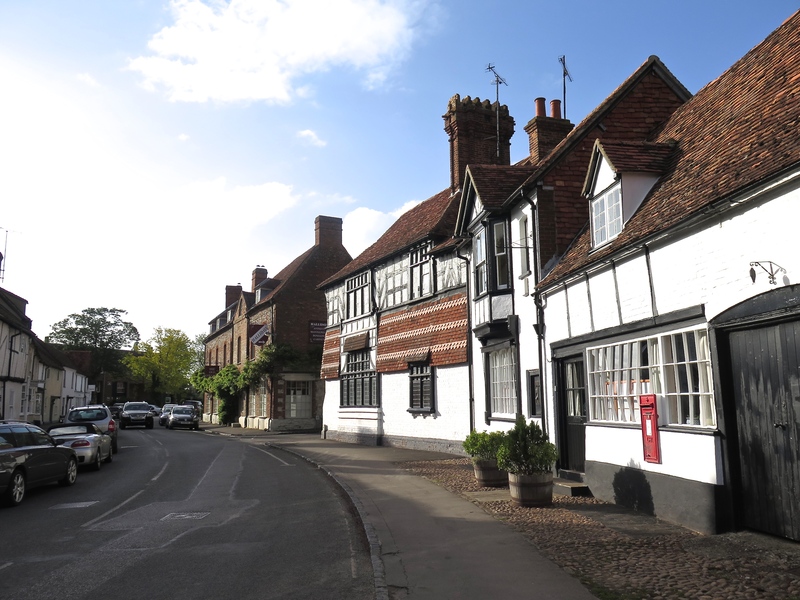 And so to Goring, a grassy open walk with The Chilterns modestly looming to the north, and across the bridge the very happy discovery of Pierrepont’s Café, so much better than handy. That stone. It was everywhere here.